Starting Friday, June 10, there are 6 opportunities this June to get your child’s energy balanced. 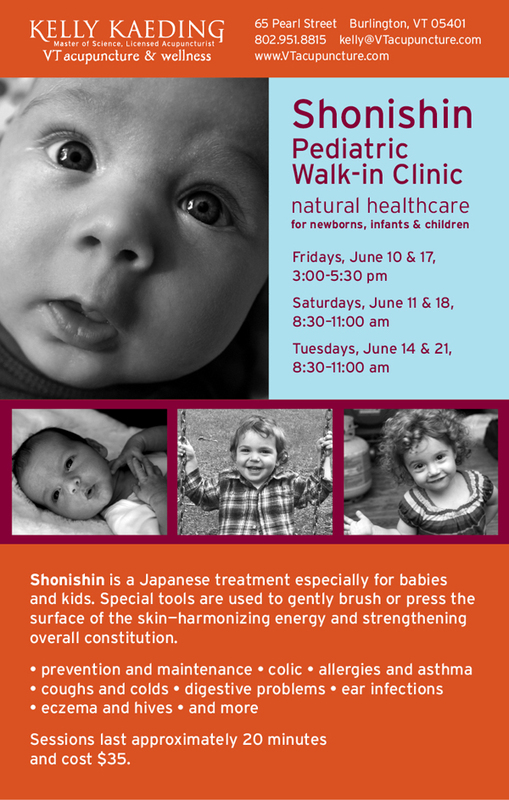 Kelly is offering a Shonishin Pediatric Walk-in Clinic at her office – 65 Pearl Street in Burlington. No appointment needed. Just come! Shonishin is a Japanese treatment especially for babies and kids. Special tools are used to gently tap and brush the surface of the skin and press acupoints – harmonizing energy and strengthening overall constitution. It is ideal to do a series of 3 shonishin treatments close together in order to rebalance the energy pattern, especially when there is a health issue. Following up with weekly treatments until symptoms subside and then monthly maintenance.